<br>Matt Simmons is a fresh recruit as a forensic detective in the police force. Hitting the ground running, Matt is faced with his first case: the horrific double-murder of a fellow detective and his wife. 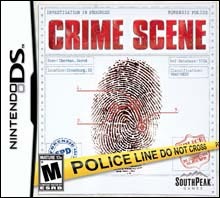 Using his arsenal of advanced forensic technology, Matt must comb the crime scene, picking up clues and trying to piece together what happened. In this thrilling mystery adventure, you'll help Matt unravel the clues in intriguing murder mysteries and clean up the town in a corrupt city where justice is a rare event.